More than 500 students will collect their diplomas from Middle Georgia State University at fall graduation ceremonies scheduled for December 14. Betty Cantrell of Warner Robins, who is Miss America 2016, will be the commencement speaker. The University will hold two ceremonies on Thursday, Dec. 14. The 10 a.m. ceremony is for graduates of programs of the College of Arts & Sciences and the School of Business. The 2 p.m. ceremony is for graduates of programs of the School of Aviation, School of Health Sciences, and School of Information Technology. Both events will be held at the Recreation and Wellness Center on Middle Georgia State's Macon Campus. Cantrell will speak at both ceremonies. Admission is limited to graduates and their guests. Local media are cordially invited to cover one or both ceremonies. Cantrell made headlines across the state when she became only the second Georgian to win the title of Miss America, a scholarship pageant that dates back to 1921. She was crowned 62 years after Neva Jane Langley Fickling of Macon won the title. After graduating from Mount de Sales Academy in Macon, Cantrell attended Wesleyan College and later Mercer University, where she studied vocal performance. She was crowned Miss Warner Robins 2015 and went on to win the Miss Georgia Scholarship Pageant, then Miss America, where she also won the talent competition with her operatic vocal performance of “Tu Tu Piccolo Iddio” from Madame Butterfly. As Miss America, Cantrell served as the National Goodwill Ambassador for Children’s Miracle Network. The student speaker for both ceremonies will be Susan E. “Lizzie” Mathias of Dublin, MGA's Student Government Association president. A senior, Mathias has served on SGA since her freshman year. She was elected president for the 2017-2018 year and represents the University's 7,400 students and all five campuses. Mathias also is a member of the President’s Torch Society, Campus Activities Board, Student Affairs’ Standing Committee, United Student Leadership, All In Campus Democracy Challenge’s Steering Committee, and Peer Career Advisors. She will graduate in spring 2018 with a Bachelor of Science in Public Service/Human Services. Her plans are to pursue a master’s degree in Social Work. She hopes to begin her career in social services at the Laurens County Department of Family and Children’s Services. Of the 516 candidates for graduation, 37 will receive master's degrees, including the first graduates of the master's degree in Nursing. Another 391 will receive bachelor degrees, while the rest will pick up career-oriented associate's degrees or certificates. Each candidate for graduation will receive four guest tickets. The availability of additional tickets for graduates is limited and will be given on a first-come, first-served basis. 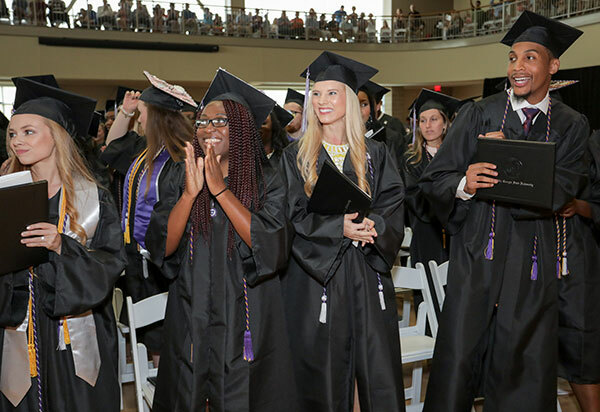 Beginning Monday, Dec. 4, through Friday, Dec. 8, graduates may pick up their four guest tickets and a maximum of two additional tickets in person at the Registrar’s Office on the Cochran or Macon campuses. The ceremonies may be viewed via live streaming at https://www.mga.edu/live/index.php. A Macon Campus map and directions are at https://www.mga.edu/about/maps.php. Media representatives may contact Sheron Smith at sheron.smith@mga.edu for more information.